Introducing Hyperbolic Power . A new technology exclusively developed by Kepco. The KLP is an entirely new laboratory grade power supply in which the voltage/current limits are automatically recalculated, forming a constant-power hyperbolic-shaped boundary between the voltage and current modes. 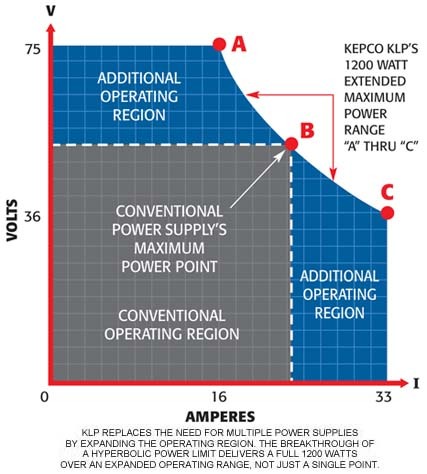 This curve, which replaces the single max-power operating point of conventional power supplies, provides the user with a greatly expanded choice of maximum power volt-ampere combinations as illustrated in the diagram by points A to B to C. The constant-power limit of the KLP is 1200 watts. The standard KLP Models (no suffix, previously referred to as -1200 models) have built-in GPIB and RS 232 interfaces. The E-Series models (suffix E, previously referred to as -1.2K Models) have built-in GPIB and LAN interfaces. The LAN interface is an LXI-approved ethernet-based interface that allows multiple-user access via a standard web browser. Both standard and E-Series KLP models employ Kepco's Hyperbolic Power  technology for full 1200 watt power over the operating range. KLP are CE Marked per the LVD, EMC and RoHS 2 Directives. See applicable Declaration of Conformity.